OG Kush Mix is a mix of three excellent OG Kush lines that the breeders at Alpine Seeds have been working with for several years. OG Kush is a resinous strain with a typical Kush flavour and good potency. It is a mostly sativa strain that grows rapidly, forming medium to long branches that stretch hugely with the onset of flowering. The flavour differs slightly according to the line, varying from a sour/lemony taste to more spicy undertones but all leave a delicious Kush aftertaste. The effect is fast and generally very relaxing. OG Kush Lemon Larry is an old OG Kush strain. It was created by crossing an OG Kush Larry cutting with an OG Kush Larry x East Coast Sour Diesel strain. This was an Elite Genetics selection. The 25% of East Coast Sour Diesel gives this strain the lemony taste, although it can be a little spicy too. Although it is sativa dominant the buds are compact and covered in resin glands, with particularly large trichome heads. As the name suggests OG Kush Lemon Larry was crossed with a very good male East Coast Sour Diesel, and then selected again by back-crossing with the original OG Kush Lemon Larry. Thus it was possible to consolidate the excellent characteristics and properties of this line. The Lemon Larry 1.1 is an even more improved version, where an OG Kush Lemon Larry female was backcrossed with an OG Kush Lemon Larry male; the plants were then self-fertilised to produce feminised seeds. This results in a resin heavy strain with a sour, lemony aroma and strong potency. Often towards the end of flowering both buds and leaves will turn a light shade of red. Although this is a longer flowering strain at 9-10 weeks it is reputed to be well worth the wait. This is the only OG Kush variation in a regular form from Alpine Seeds. For this line the OG Kush Lemon Larry was taken and crossed with a male Kush BX1 San Vernando Valley. The resulting Kush generation is a very good resinous strain with a spicy Kush aroma and a larger indica influence in growth. It is the larger yielding line but with a similar structure to the other lines, and also produces firm, compact buds. It does throw a few different phenotypes but all have typical Kush features and just differ slightly in growth, maturity time and a little in the flower structure. The flowering time is 65-75 days for all phenotypes. All three of these OG Kush lines have special qualities concentrated around their resin production and high quality aroma. These are a step up from the “White” strains of bygone times. 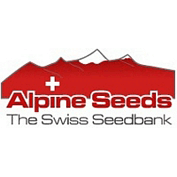 Alpine Seeds are the most popular breeder collective in Switzerland, who, over the past decade have aimed to improve the deterioration of quality strains available in their country and around Europe. To distance themselves from other European seedbanks, Alpine have created their own strain varieties, without using any Dutch genetics, believing them to be severely overused. This breeder collective all started as cultivators who were simply growing for themselves. Now, as a collective, they have set themselves the unenviable task of providing quality and unusual cannabis genetics at reasonable prices. Many of the breeders at Alpine Seeds started life at Herbaria Seeds, another Swiss seedbank which has faded in popularity in recent times. During their time at Herbaria, these breeders were able to collect, select and refine some excellent genetics that never made it onto the European market. Some of these strains have now been released by Alpine Seeds, with great success. Focusing predominantly on North American elite varieties, Alpine Seeds place much value in the quality, potency, flavour and taste of their hybrids. This can be seen clearly in their comprehensive library of strains. Their Swiss Strawberry x Sweet Pink Grapefruit was released due to overwhelming demand for fully stable strawberry genetics. It is an adaptable plant that has a memorable aroma, taste and cerebral effect. Another one of their popular strains, Sweet Tooth 3 BX2 is an indica dominant strain with some immense resin production and superb flavours that start fruity but end with a sour note. Being the only Swiss seedbank that has established itself in the European market, Alpine Seeds are carrying the pressure of their country on their shoulders but have never failed to deliver quality and unusual genetics that have generated interest across the globe. The entire collection from Alpine Seeds’ spectacular library of affordable strains is available on Seedsman now.